We are happy to present our first SUP and Surf hydrofoil kit. Completely made out of 100% carbon fiber our kit is lighter and more stable than anything you ever tried before. Order now on discount price and be the first to try it. 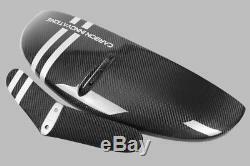 Material - Custom carbon fiber Pre-preg Type of CF - twill wave 240 grm/sq. M (two layers) Finish - UV resistant clear coating Both foils are filled with foam from inside. Dimentions of front foil - 27 (68 cm) with surface area of 1406 cm2. 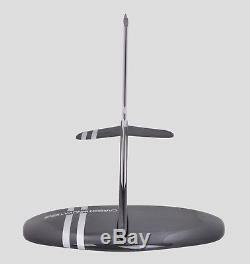 Dimensions of tail foil - 14 (35 cm) with surface area of 307 cm2 Foils set weight - 1 kg (0.9 kg front foil and 0.1 kg tail foil) Screws type for main foil - 40-45 mm (m8) Screws type for tail foil - 18-20 mm (m8) Hole type - custom carbon fiber tube. M (multiple layers) Finish - UV resistand clear coating Filled with foam from inside. Length - 30 (76,2 cm). Weight - 360 g Screw hole type - m8. M (multiple layers) Finish - UV resistand clear coating Filled with resin from inside. 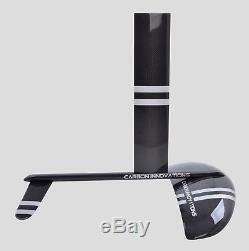 Length (standard mast / long mast) - 23,6" (60 cm) / 33,5" (85 cm). Weight (standard mast / long mast) - 650 g / 880 g. Screw hole type - m8. Mast to board connection should be made with tuttle box or mast collar (not included)! You should order mast to board connection elements separately. Without any cheap fiberglass backing layers! With high pressure and high temperature. Autoclave oven, producing a strong and lightweight product! Finished in a UV resistant, deep gloss lacquer, polished by hand. Direct bolt on replacement and easy installation. We are - Carbon Innovations , company with an experience of more than 10 years in creating products of composite materials such as carbon fiber and fiberglass auto\moto stuff. We have own full-cycle production, own workshop service and magazine in Kiev. We dont work on holidays. These charges are the buyers responsibility. We will replay your message with in 48 hours. We only sell Top Quality products! Enjoy the shoping whith Us! 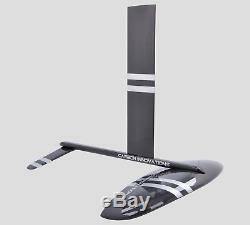 The item "Surf SUP Hydrofoil Carbon Fiber foil Kit Formo F27" is in sale since Saturday, February 10, 2018. 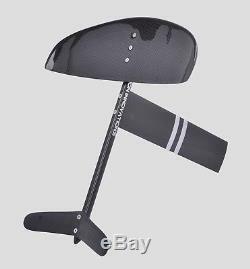 This item is in the category "Sporting Goods\Water Sports\Surfing\Other Surfing". 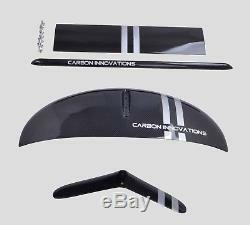 The seller is "carboninnovations1" and is located in .